Here's (sort of) another one of those Nurse With Wound list rarities the kids go nuts over. 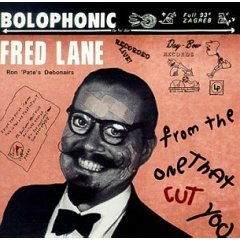 Fred Lane is T.R. Reid, who is a sculptor turned crooner. His band, Ron Pate's Debonairs, appears on the CD and the aforementioned list. Before I had any idea about any of those NWW wonders, except maybe Beefheart and Zappa, I stumbled across this one in the local record store. It walks a thin line between pleasingly weird and silly, and too goddam weird and silly to be entertaining. Nearly twenty years after I first got it, I still like it, so it walks that line well. This is the second of two Shimmy Discs for Fred. The first, which I'm guessing was a later recording, is better recorded and more song oriented. This one seems kind of home recorded, and way off the deep-end into free jazz big band skronk. If one of you could point me at the Ron Pate album, I'd be forever grateful. That'd go double for a share of the unreleased third Fred Lane album. hearing this record again made my day. do you know what year this came out? Fantastic! I haven't downloaded yet (waiting for Rapidshare to let me) but I've been looking for Fred Lane for a long time. Would you be interested in posting the one with "car" and "jerome" and "radio" in the title? somebody must have it !!! !